It’s Day 1 of the American AAdvantage 2015 reveal, and as expected, the blogosphere has been quite abuzz about it. I haven’t written anything specific about it because there’s not much additional that I can say that hasn’t been said about it. I first saw news about it from The Forward Cabin, but View From the Wing had a nice article mentioning some of his conversations with AAdvantage President Suzanne Rubin. One Mile at a Time, the Wandering Aramean and MJ on Travel also had their takes, and most people viewed the changes pretty positively. One alternative take was from the Charlotte-based Carolina Travel Girl, who gave a viewpoint from the perspective of an US Airways elite. The best news (and really the only important news in my book) is the award chart, which remains (mostly) unchanged. The partner (oneworld) award chart is exactly the same, and there are slight changes to the actual American award chart. For the Mile SAAver section, the values are still the same. You can see the off-peak section (January 12 – March 13, August 22 – December 15) for Economy flights from North America to Hawaii for only 17,500 miles. I find it somewhat confusing that there is a Level 1 and Level 2 in both the SAAver as well as the AAnytime sections. They are completely unrelated! :-). American has broken down the existing AAnytime rewards into 3 different levels. The existing AAnytime values (which I would almost never recommend) are now “Level 1” and because those weren’t bad enough redemptions, they’ve added 2 more levels! Whether an AAnytime award is Level 1 or Level 2 (or even Level 3) is controlled by date, and those dates have not been published. Qualifying for Elite Status will be mostly based on the way it worked for American. One major difference is that elites on US Airways will move from having 4 different levels to the 3 levels in the American system. 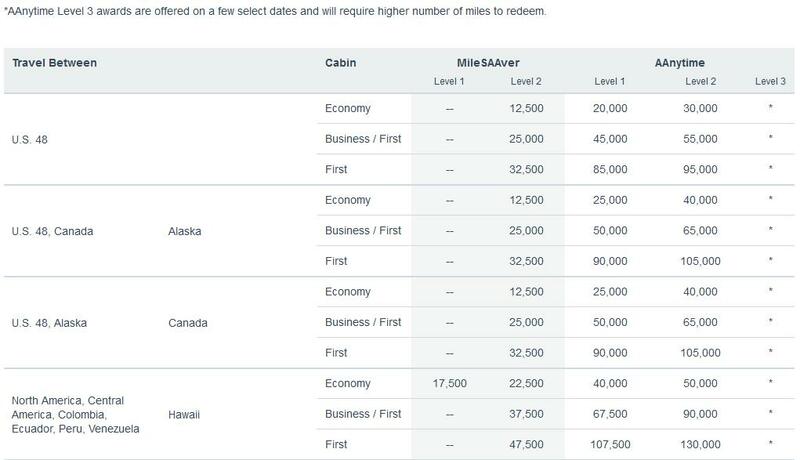 Upgrades will still be different on American and US Airways flights until we have a single reservation system at the end of next year. Here’s how upgrades will work once we combine our loyalty programs in the second quarter of 2015. I don’t mean to gloss over those areas too much – but since I’m not elite on either (or any) airline, nor do I expect to be any time soon, if you’re interested in learning more about that, you can check the American AAdvantage 2015 site, or read the report from The Forward Cabin.